The Ducati Multistrada 950 is the Bologna-based bike manufacturer’s smallest “multibike”, designed to provide all the excitement of the Multistrada in a way that makes it more accessible and versatile. Designed to put great performance within everyone’s grasp, the Multistrada 950 is for those who want to get in some touring (and perhaps enjoy the company of a passenger) and those who want an agile fun bike that’s ideal for everyday use. The Multistrada 950 is now available also with spoked wheels as standard equipment. Combining the Multistrada family’s trademark design and chassis geometry, the Multistrada 950 has it all. 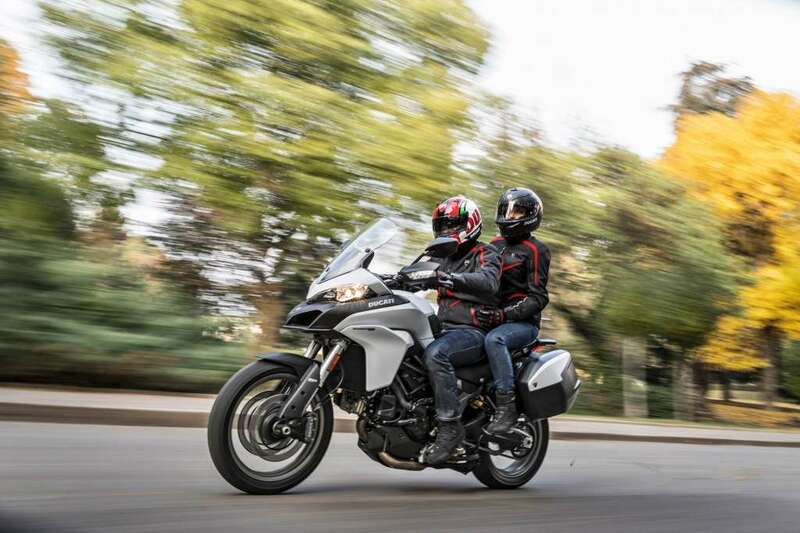 Lighter than the Multistrada 1200 and with a seat height of 840 mm, the Multistrada 950 sharpens the excellent dynamic performance of its “big sisters”. The 19″ light alloy front wheel ensures comfort and fun on any road surface, asphalted or not. Suspension with a generous 170 mm of travel and a twin-sided swingarm keep comfort levels high while giving the Multistrada 950 outstanding agility. Moreover, the 20-litre tank puts plenty of miles between refuelling stops. The 937 cm3 Testastretta engine gives the Multistrada 950 true Ducati verve – and makes it accessible to everyone. This engine delivers 113 hp (83.1 kW) at 9,000 rpm and a maximum torque of 9.8 kgm (96.2 Nm) at 7,750 rpm. The four Riding Modes (Touring, Sport, Urban and Enduro) give the Multistrada 950 true 4-bikes-in-1 capability. Maintenance is as worry-free as it gets: the 937 cm3 Ducati Testastretta 11° twin cylinder engine has a maintenance interval of 15,000 km (9,000 miles) or 12 months, with valve clearance inspection every 30,000 km (18,000 miles). The Multistrada 950 is both confidence-inspiring and safe thanks to the Ducati Safety Pack, which includes the latest Bosch 9.1 MP ABS with 3-level adjustment and 8-level Ducati Traction Control. These safety systems apply different intervention levels depending on the selected Riding Mode; riders can personalise them to set up the Multistrada 950 to match their individual needs and riding skills. Touring Pack: side panniers and centre stand. Sport Pack: type-approved Ducati Performance exhaust by Termignoni (complies with EU homologation standards), billet aluminium frame plugs, billet aluminium front brake fluid reservoir plug. Urban Pack: top case, tank bag with tank lock and USB hub to charge electronic devices. Enduro Pack: supplementary LED lights, Ducati Performance components by Touratech: engine crash bars, aluminium radiator guard, aluminium sump guard, broader kickstand base and off-road rider pegs. 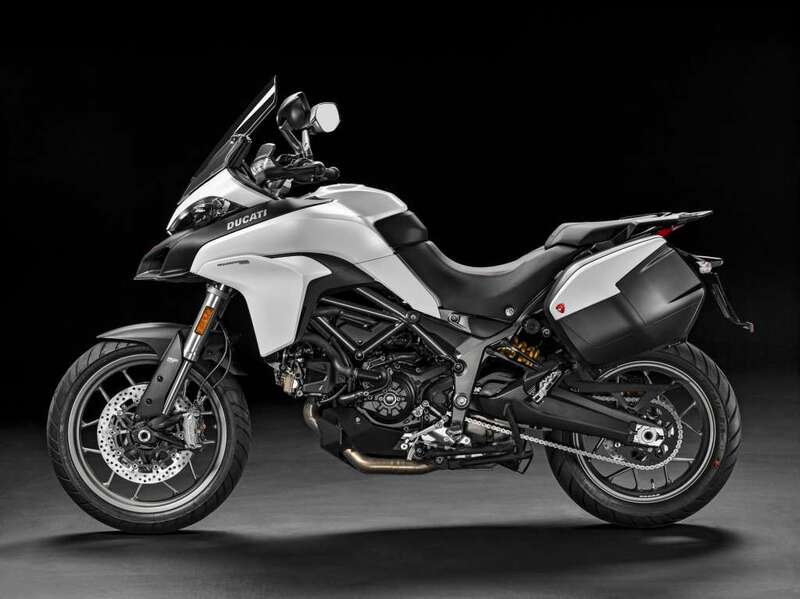 When the Ducati Design Center started working on the Multistrada 950 the goal was to develop a compact, eye-pleasing bike that had to be, above all else, a true Multistrada. That’s why it takes its cue from the two bigger-engined Multistrada family members. The Multistrada 950 combines Multistrada 1200 and Multistrada 1200 Enduro design features to perfection, taking the “lightest” elements from both. 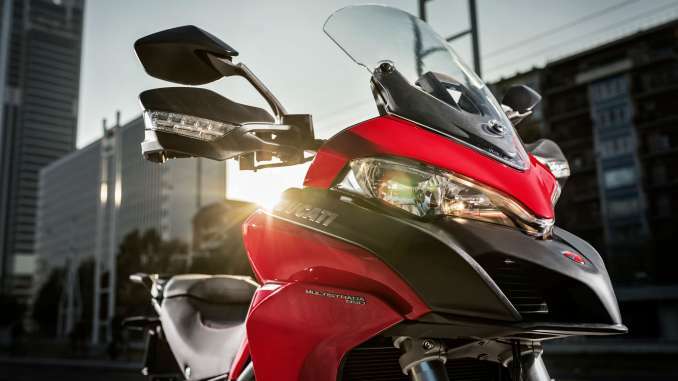 The front-on view, with the distinctive headlight, ‘beak’, adjustable screen, two ‘wings’ and tank come from the Multistrada 1200. The rider’s seat with narrow mid-section, the passenger seat, rear grab rail, the design of the exhaust and swingarm and the wheel sizes were, instead, taken from the Multistrada 1200 Enduro. This mix has produced a bike with classic Multistrada lines that’s also compact, and not just visually. Moreover, the bodywork colour that extends to the seat and the numerous black-painted parts – such as the engine guard, silencer and swingarm – make the Multistrada 950 look even lighter. Carefully designed alloy wheels have succeeded in making the thin Y-spokes look as similar as possible to wire spokes. Other Multistrada 950 hallmarks include the assertive, high-tech front headlight and LED tail light. Features such as the frame (designed to maximise efficiency in terms of both weight and performance), the rear sub-frame (aluminium with integrated pannier supports) and switchgears (ergonomic and practical) are just some of the characteristics that underscore Ducati’s attention to detail. The Multistrada 950 is available in two colours; classic Ducati Red and stylish Star White Silk. Both colour schemes feature matt grey frame and wheels. Built with long-range touring in mind, the Multistrada 950 has been designed to ensure outstanding comfort, even when the bike is fully laden. This has resulted in an ergonomic “triangle” that guarantees, for rider and passenger alike, comfort and control whatever the situation. The bike is ‘roomy’. It can easily seat two people, even with top case and side panniers on board. A 1594 mm wheelbase distributes rider and luggage (where applicable) weight perfectly, benefiting the vehicle’s dynamic performance. Foot pegs have been lined with rubber inserts to dampen vibration. The Multistrada 950 seat is 840 mm off the ground (a lower 820 mm seat and a higher 860 mm one are available as Ducati Performance accessories) and its generous front and rear sizing means immediate comfort and assured wanderlust. The wide tapered handlebars have been designed to optimise comfort, provide a dominant riding position and make the most of the generous steering lock. And that’s not all: it’s been mounted on silent-blocks to filter out vibration, giving an optimal balance between comfort and ‘feel’. A spacious stowage area under the passenger seat can be used for tools, the motorcycle handbook and personal items. The GARMIN sat-nav, available as a Ducati Performance accessory, is powered via a special connector in the dashboard area. There’s also a USB port underneath the seat: this can be used to charge smartphones or other devices. The twin cylinder Testastretta 11° engine on the Multistrada 950 features two cylinder heads with a redesigned oil circuit and secondary air intake ducts on the covers. The Multistrada 950 gulps in the fuel mix through 53 mm cylindrical-section throttle bodies controlled by an advanced Ride-by-Wire system. Moreover, this engine also features a control unit and electronic injection system. The exhaust system is of the 2-1-2 type with lateral silencer. The clutch, instead, is of the oil bath type with slipper function and low-effort lever control. The slipper function cuts in when the rear wheel exerts back-torque, reducing pressure on the discs to ensure vehicle stability during the aggressive down-shifting typical of competitive riding. The 937 cm3 Ducati Testastretta 11° twin cylinder engine has a maintenance interval of 15,000 (9,000 miles) km or 12 months, with valve clearance inspection every 30,000 km (18,000 miles). 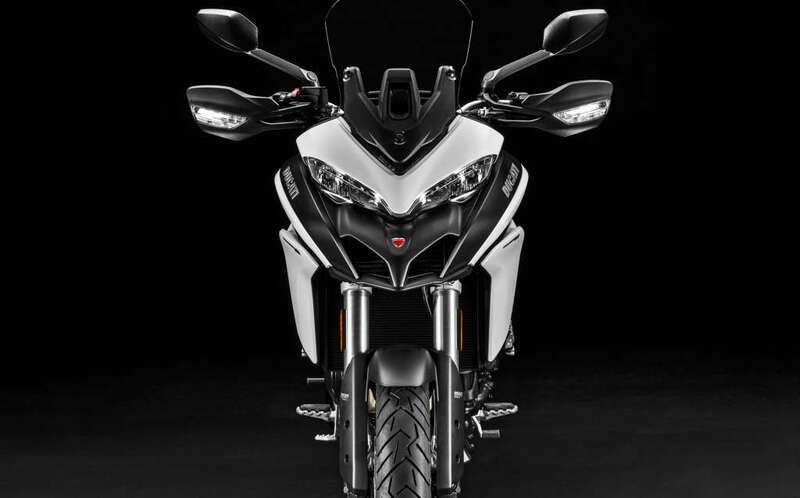 On the Multistrada 950 the frame design features a front Trellis made up of large-diameter yet thin tubing, plus two lateral aluminium sub-frames to ensure maximum torsional rigidity. The Multistrada 950 has a minimum ground clearance of 183.5 mm. The shell-cast aluminium twin-sided swingarm is painted black. The Multistrada 950 has a front upside down 48 mm fork with 170 mm of travel, a dedicated cast fork leg, plus adjustable spring pre-load and hydraulic compression and rebound damping. At the rear, a Sachs shock connects the swingarm to the left sub-frame: again, spring pre-load is adjustable (via a knob-operated hydraulic press), as is hydraulic compression and rebound damping. The spring is progressive, consequently increasing ride comfort even with the bike fully loaded. Rear suspension travel is 170 mm. The Multistrada 950 is equipped with alloy wheels that mount Pirelli SCORPION™ Trail II tyres: 120/70 R19 at the front and 170/60 R17 at the rear. SCORPION™ Trail II: this tyre is a perfect blend of off-road racing capacity and great road performance. Designed for the most demanding motorcyclists, its plus-points include high mileage, consistent performance throughout its life-cycle and first-class performance in the wet. The Multistrada 950 features Brembo M4.32 monobloc radial calipers with four 32 mm diameter pistons and 2 pads, an axial pump and dual 320 mm front discs. At the rear a 265 mm disc is gripped by a floating caliper, again by Brembo. Such top-drawer components ensure unbeatable performance, a feature that has always been a Ducati hallmark. The Multistrada 950 is equipped with a DSP (Ducati Safety Pack) that includes ABS and Ducati Traction Control, enhancing bike performance, optimising control and boosting safety levels. This package is managed via four different Riding Modes, each of which (Sport, Touring, Urban and Enduro) gives the Multistrada 950 a distinctive personality thanks to different ABS and DTC (Ducati Traction Control) settings. Multistrada 950 standard equipment includes a Brembo braking system with ABS, controlled by the Bosch 9.1 MP control unit with integrated pressure sensor, which is part of the Ducati Safety Pack (DSP). The 3-level system ensures short stopping distances and stability whatever the riding conditions thanks to full integration with Riding Modes. Level 1 adapts ABS intervention to off-road use: there is no intervention on the rear wheel and no rear wheel anti-lift. Level 2 sees the ABS act on both the front and rear wheels but rear wheel anti-lift remains deactivated. Lastly, the highest level 3 setting provides maximum braking stability and rear wheel lift-up prevention. The ABS system can be deactivated in any Riding Mode and will stay off until the next Key-On. 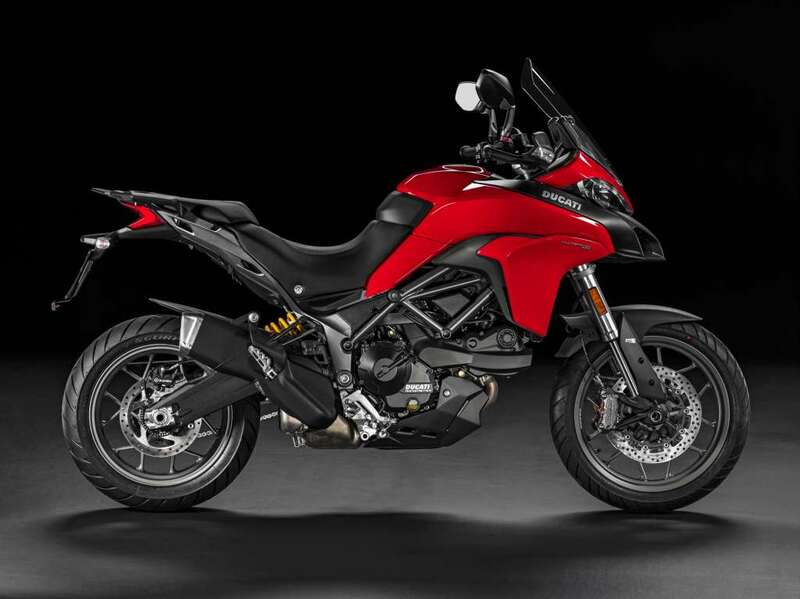 The DTC (Ducati Traction Control) on the Multistrada 950 detects and subsequently controls any rear wheelspin, enhancing both bike performance and active safety. The Multistrada 950 features the latest DTC software version, optimised to ensure a soft response thanks to intervention on both spark advance and throttle body control. The system lets riders select from among 8 different profiles, each calibrated to provide a rear wheelspin tolerance that matches progressive levels of riding ability (classified from 1 to 8). Level 1 minimises system intervention and is, together with level 2, best suited to off-road use. Level 8, instead, maximises ABS intervention and is ideal on wet roads. Ducati sets DTC levels for each of the four Riding Modes; however, these can be personalised to meet riders’ specific needs and saved on the individual menu settings. The DTC function can be switched off in any Riding Mode and will then stay off until the next Key-On. Ducati Riding Modes, first introduced on the Multistrada in 2010, let riders select different pre-set modes that optimise bike behaviour according to their individual riding styles and road conditions. The Multistrada 950 has four Riding Modes (Sport, Touring, Urban and Enduro), each programmed to act on the electronic Ride-by-Wire (RbW) engine control system and the ABS and DTC levels. The available modes stem from a combination of cutting-edge dedicated technologies. Riding Modes can be changed on the go, while personalised ABS and DTC settings need to be made with the bike at standstill with the throttle closed. Touring Riding Mode delivers 113 hp with progressive Ride-by-Wire throttle twist response, DTC is set higher (level 5) as is the ABS (level 3), maximising both braking stability and wheel lift-up prevention. Selecting Sport Riding Mode transforms the Multistrada 950 into an adrenalin-fuelled 113 hp machine. This Riding Mode is characterised by a direct Ride-by-Wire throttle twist response, a low DTC setting (level 4) and low ABS setting (level 2) with no rear wheel lift-up prevention. Urban Riding Mode delivers a maximum power of 75 hp with progressive Ride-by-Wire throttle twist response; DTC is set to an even higher intervention level (level 6) and the ABS setting is at level 3, maximising braking stability and wheel lift-up prevention. Enduro Riding Mode gives the Multistrada 950 a maximum power of 75 hp with progressive Ride-by-Wire throttle twist response; DTC intervention is suitable (level 2) for off-road use and the ABS setting is low (level 1), deactivating rear wheel lift-up prevention. The Multistrada 950 instrument panel consists of a large easy-to-see LCD that provides the rider with primary and secondary information. The unit gives info on speed, rpm, total distance ridden, selected gear, trip1 and trip2, engine coolant temperature, fuel level and, of course, a clock. And that’s not all: the display shows the selected Riding Mode, miles remaining, real-time fuel consumption, average fuel consumption, average speed, air temperature, travel time and road ice warning. 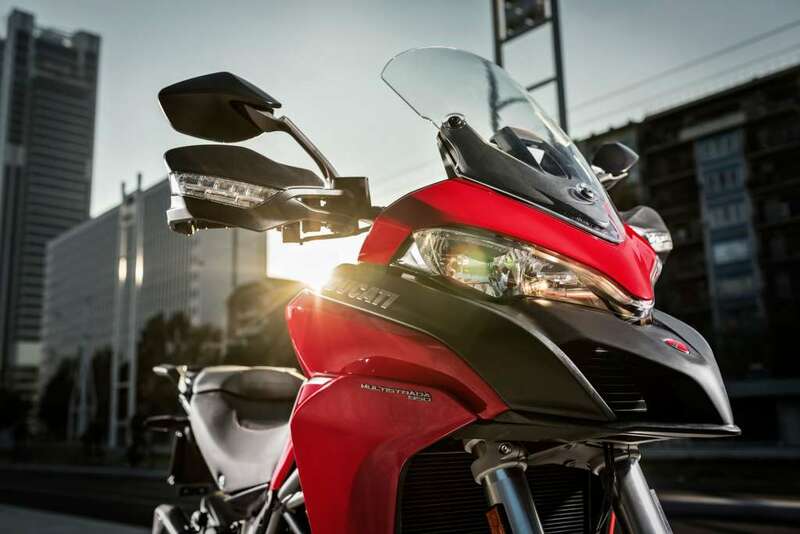 Like other bikes in the Multistrada family, the 950 has an assertive-looking, high-tech headlight. At the rear there is a LED tail light. A hazard warning lights function is also available on the Multistrada 950; this is activated by pressing the dedicated key.